Home Redistricting Does Representation Matter to Me? It is the early 1770s. The cry, “Taxation without representation” is fanning the flame of independence in the Colonies. Many believe it is wrong for a people to be taxed without having any say in the matter. Eventually, the Colonies sever all ties with England and form a new government based on a representative society, with careful checks and balances incorporated within the system to avoid any one person or group gaining too much power. “That a frequent recurrence to fundamental principles, and a firm adherence to justice, moderation, temperance, industry, and frugality are absolutely necessary to preserve the blessings of liberty, and keep a government free” (Chapter 1 Right 14). Everyone wants to enjoy the blessings of liberty, but few make the connection to representation. At the most basic level, if a person cares about their taxes, they should follow in the steps of our founders and care about who is speaking on their behalf in the state capital. Many other issues addressed at a state level touch close to home – like education, roads, and safety. When Pennsylvanians gather to discuss these state issues, who will speak on your behalf? The boundaries of districts (determined by redistricting) define how you will be represented. Will your community be given a united voice or fragmented into little pieces and left with the effect of having no say? 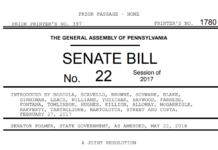 Redistricting, at least in Pennsylvania, was originally intended to ensure that people not only were offered equal representation but united representation. If the people do not stay engaged with this redistricting process, then this intent may be lost in the political shuffle. The ability to select who represents us is at the very core of why the United States was founded in the first place. People laid down their honor, fortunes, and even lives to secure representation. It mattered to them. It should matter to us. Coming soon are related articles on The Story of Reapportionment and Should Political Subdivisions Stay Whole? Sign-up for email updates to receive the latest posts.